Call Us On 0435 923 817 Now! 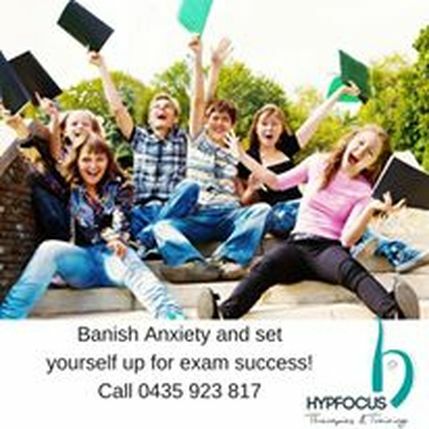 Hypnotherapy for Study, VCE Help - and to Perform at Your Best! It's important to recognise that it's almost inevitable that stress will make it more difficult to focus, absorb and retain and relay information in order to perform to the highest level. Hypnotherapy does not replace the requirement for study, preparation and dedication, however it enables you to achieve a state of calm, focus and absorption that makes it easier for you to access what you've learned when you need to. I have developed a Hypnotherapy program to provide you with the tools you need to manage the symptoms of anxiety and stress, and to increase your ability to focus and deliver. Using a combination of Counselling Therapies and Hypnotherapy techniques I will work with you to help you increase your confidence, sleep better, improve your study focus and absorption, as well as increase preparation stamina and stay on top of your time management. Procrastination will no longer eat up hours of your day! Don't let Stress reduce performance, increase the likliehood of achieving the best results possible, no matter what it is you are undertaking I can help you to give it your best shot. Improve your ability to access and utilise you personal resources to achieve your full potential! Call now to book your appointment on 0435 923 817!